For other people with the same name, see Joe Mason (disambiguation). Joseph Mason (born 13 May 1991) is a professional footballer who plays as a striker. Mason began his career with Plymouth Argyle, his home town club, for whom he made 53 Football League appearances. While at Cardiff he scored in the 2012 Football League Cup Final and won promotion to the highest level of English football. Mason played youth international football for the Republic of Ireland by virtue of his mother, who was born in County Mayo. Mason began his career as a youth player with home-town club Plymouth Argyle at the age of 10. He was a regular scorer for the youth team and made the step up to reserve team football with similar ease, playing his part as the club won the Football Combination in 2009, with Mason as the club's top goalscorer. He signed his first professional contract with the club in May 2009, and immediately set about breaking into the club's first team, describing becoming a professional as a very proud moment. He began the 2009–10 season training with the first-team squad and again featured regularly for the club's reserves. He made his competitive debut, and his first start, for the club against Sheffield United at Home Park on 5 December 2009, playing for 65 minutes before being replaced by Craig Noone to a standing ovation. He signed an extension to his contract with the club in January 2010 until the summer of 2012, with Paul Mariner commenting that the youngster has a very bright future. He scored his first senior goal in the return fixture against Sheffield United at Bramall Lane on 27 February 2010. On 8 July 2011, Championship side Cardiff City agreed a £250,000 transfer fee for Mason. Two days later the deal was completed and he signed a three-year deal with the Welsh club. Mason made his debut for Cardiff in a 1–0 win at West Ham United on 7 August 2011, replacing Craig Conway as a second-half substitute. He made his first start on 17 August in a home match against Brighton & Hove Albion, which Cardiff lost 3–1. Mason scored his first goal for the club on 22 October, in a 5–3 victory over Barnsley. His next goal came three days later in the League Cup, the goal against Burnley meant that Cardiff reached their first League Cup quarter final since 1965. Mason scored his fifth goal of the campaign in a 3–1 win at home to Reading on 2 January 2012. 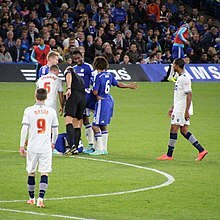 Having helped Cardiff reach the final of the League Cup, Mason scored the first goal against Liverpool at Wembley Stadium on 26 February. With the score level after 90 minutes, Mason was substituted for Filip Kiss. Cardiff lost 3–2 on penalties after the game finished two-all. Mason scored his 9th and 10th goals against fellow play-off hopefuls Brighton and Middlesbrough respectively, which put him in the top three goal scorers at Cardiff. On 20 April, Mason signed a new contract to extend his stay in the Welsh capital until the summer of 2016. He celebrated his contract extension with a goal against Leeds United, then later on Mason was awarded the Club Young Player of the Year award. He enjoyed a really impressive first season in the Welsh Capital having scored 12 goals, more than he scored in his previous two put together and Cardiff had reached the play-offs but were however knocked out by West Ham United in the semi-finals. Mason collected his first goal of the 2012–13 season on 25 August against severnside rivals Bristol City, which was also his 50th appearance in a Cardiff shirt. He scored his second of the season on his third league start against Burnley on 27 October, before scoring one of City's goals in the 5–4 defeat to Charlton Athletic soon after. His fourth came on 7 December, scoring the third in a 4–1 win at Ewood Park against Blackburn Rovers. Mason scored on New Years Day against Birmingham City, which took Cardiff seven points clear at the top of the table. Mason registered his sixth goal of the 2012–13 season after coming on as a substitute against Blackburn Rovers on 1 April 2013, at Cardiff City Stadium. On 11 November 2013, a loan deal was agreed with Football League Championship side Bolton Wanderers until 5 January 2014. However, the following day it was announced that Cardiff manager Malky Mackay had a change of heart over the deal and the striker stayed in South Wales, despite having travelled up to Bolton to train with them on the previous day. A move to Bolton was finally completed on 27 November 2013 once Cardiff's injury situation had cleared up, and this allowed Mason to link up with Wanderers until the New Year on a similar arrangement to that of teammate Kevin McNaughton. He made his Bolton debut on 30 November 2013 in an away defeat against Middlesbrough at the Riverside Stadium as a substitute for Neil Danns. His first start and goal came a week later as he opened the scoring for Wanderers in a 3–0 win over Doncaster Rovers at the Reebok Stadium. On 20 February 2014, Mason re-joined Bolton Wanderers on a two-month loan. On 11 August, Mason once again joined Bolton on loan, this time for the full season. On 16 September, Mason scored a second half hat-trick to earn Bolton their first win of the season at home to Rotherham United. This was the first hat-trick scored by a Bolton player in a competitive match since Fredi Bobic against Ipswich in 2002. On 21 January 2015 his loan was terminated by mutual agreement. Following his return from injury, Mason became a key part in new Cardiff boss, Russell Slade's plans towards the end of the 2014–15 season. The next season, Mason was rewarded the number 10 shirt and started the first 17 games of the season, with a return of 5 goals. During October, Cardiff suffered a barren run of goals scoring only 2, one where Mason scored the opener in a 1–1 with Brighton & Hove Albion. This resulted in Mason being dropped and new signing Tony Watt taking his place. On 28 January 2016, Mason signed a three-and-a-half-year contract with fellow Championship club Wolverhampton Wanderers for an undisclosed fee. He made his debut for Wolverhampton Wanderers on 2 February 2016 against Bolton, in a 2–2 draw at Molineux, in which he scored after three minutes of the game. The following season saw him score four further goals (including against Midlands rivals Birmingham and Aston Villa), to add to the three for Wolves in the second half of the previous campaign. However, after another new head coach arrived -–the fourth different one at Wolves within his short spell – Mason found himself out of his plans. On 23 August 2017, he was sent on loan to fellow Championship side Burton Albion until January 2018. He scored on his debut for Burton in a 1–1 draw with Sheffield Wednesday on 26 August 2017. After returning from his spell at Burton, he moved again on loan, this time to Major League Soccer side Colorado Rapids on 20 February 2018 until the end of the 2018 MLS season. On 12 July 2018, it was announced that Mason would end his planned season-long loan early and return to Wolverhampton. As the 2018–19 season began in England, Mason still remained outside of the first team plans at Wolves, who had by now been promoted to the Premier League. On 31 August 2018, he was loaned out to League One Portsmouth until January in a move which saw him again link up with Kenny Jackett who had signed him at Wolves. However, he made just a single appearance in the league for Pompey, appearing as a late substitute against Wycombe Wanderers. On the final day of the January 2019 transfer window, his contract with Wolves was terminated by mutual agreement to allow Mason to find a new permanent club. Mason was born in Plymouth, but was eligible to represent the Republic of Ireland because his mother was born in County Mayo. He represented the Republic at under-16 and under-18 level before being called up to the under-19 squad for the Four-Nation tournament and their qualifying games in the UEFA Under-19 European Championships. He played in their 2–0 win against Turkey, and their 1–0 defeat to Portugal as the Irish finished second, behind Netherlands. He scored twice for the Republic in their 5–0 win against San Marino, and played a crucial role in their 2–0 win against Albania. The Irish finished second in Group 1, behind Italy, and both qualified for the elite round which took place in May 2010. Mason received his first call-up to the under-21 side in July 2010, and made his debut two months later in a 1–0 defeat to Switzerland. Mason grew up supporting Plymouth Argyle and attended St Boniface's Catholic College. His older brother, Anthony, was an apprentice at the club and signed a professional contract in 2007, but was released without making a first team appearance and went on to play non-league football. ^ "Professional retain list & free transfers 2012/13" (PDF). The Football League. 18 May 2013. p. 11. Archived from the original (PDF) on 2 August 2014. Retrieved 30 July 2013. ^ "Player Profile – Joe Mason". Premier League. Retrieved 7 September 2013. ^ "Player profile" Plymouth Argyle F.C.. Retrieved 1 January 2010. ^ "Pilgrims part with Smith & add three" The West Briton. Retrieved 1 January 2010. ^ a b "Argyle's Mason looks to thrive" The West Briton. Retrieved 1 January 2010. ^ "Joe's in the pink" Plymouth Argyle F.C.. Retrieved 1 January 2010. ^ "Deal done" Plymouth Argyle F.C.. Retrieved 1 January 2010. ^ "Mason signs up" BBC Sport. Retrieved 16 January 2010. ^ "Mason: I want to push on now" Western Morning News. Retrieved 2 March 2010. ^ "Cardiff target Plymouth striker Joe Mason". BBC Sport. 8 July 2011. Retrieved 8 July 2011. ^ "Mason completes Bluebirds switch". Cardiff City Football Club. 10 July 2011. Archived from the original on 10 September 2011. Retrieved 10 October 2013. ^ Da Silva, Michael (7 August 2011). "West Ham 0–1 Cardiff". BBC Sport. Retrieved 7 August 2011. ^ "Joe earns first Bluebirds start". Cardiff City. 10 October 2013. Archived from the original on 6 September 2011. Retrieved 5 September 2011. ^ "Cardiff 1–3 Brighton". BBC Sport. 17 August 2011. Retrieved 5 September 2011. ^ "Cardiff 5–3 Barnsley". BBC Sport. 22 October 2011. Retrieved 22 October 2011. ^ "Cardiff 1–0 Burnley". BBC Sport. 25 October 2011. Retrieved 25 October 2011. ^ Taylor, Daniel (26 February 2012). "Liverpool beat Cardiff City in penalty shootout to win Carling Cup final". The Guardian. Retrieved 26 February 2012. ^ Markham, Carl (26 February 2012). "Liverpool win Carling Cup after gripping penalty shootout". The Independent. Retrieved 26 February 2012. ^ "Liverpool 2 Cardiff City 2 (aet, 3–2 on pens): Reds lift Carling Cup after dramatic shootout". Daily Mail. 26 February 2012. Retrieved 26 February 2012. ^ Bevan, Chris (26 February 2012). "Cardiff 2–2 Liverpool". BBC Sport. Retrieved 26 February 2012. 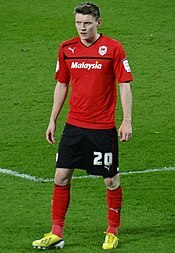 ^ "Joe Mason agrees to Cardiff City contract extension". BBC Sport. 20 April 2012. Retrieved 20 April 2012. ^ "Peter Whittingham named Cardiff City Player of the Year". South Wales Echo. 22 April 2012. Retrieved 22 April 2012. ^ "Bolton Wanderers sign highly rated Cardiff City striker Joe Mason on loan". The Bolton News. 11 November 2013. Retrieved 11 November 2013. ^ "Cardiff City pull the plug on Mason loan after less than 24 hours". The Bolton News. 12 November 2013. Retrieved 12 November 2013. ^ "Bolton Wanderers finally sign loan deal with Cardiff City striker Joe Mason". The Bolton News. 27 November 2013. Retrieved 27 November 2013. ^ "Mason re-joins on loan". Bolton Wanderers FC. 20 February 2014. ^ "Bolton sign Cardiff striker Joe Mason for third loan spell". BBC Sport. 11 August 2014. Retrieved 11 August 2014. ^ "Joe Mason: Wolverhampton Wanderers sign Cardiff City striker". BBC Sport. 28 January 2016. ^ "Wolves 2–2 Bolton". BBC Sport. 2 February 2016. ^ "Joe Mason: Burton Albion sign Wolves striker on loan until January". BBC Sport. 23 August 2017. ^ "Burton 1–1 Sheff Wed". BBC. 26 August 2017. Retrieved 29 August 2017. ^ "Colorado Rapids acquire striker Joe Mason on loan from Wolverhampton Wanderers FC". Colorado Rapids. 20 February 2018. ^ "Colorado Rapids forward Joe Mason returns to Wolverhampton Wanderers F.C." Colorado Rapids. 12 July 2018. ^ "Joe Mason: Portsmouth sign Wolves forward on loan". BBC Sport. 31 August 2018. ^ "Portsmouth loanee returns to Wolves". Portsmouth F.C. 12 January 2019. ^ "Iorfa one of five to depart". Wolverhampton Wanderers F.C. 31 January 2019. ^ "Joe Mason says Plymouth Argyle will benefit from his international experience". Western Morning News. 3 September 2010. Retrieved 26 February 2012. ^ "Called up" Plymouth Argyle F.C.. Retrieved 1 January 2010. ^ "Trio called up" Plymouth Argyle F.C.. Retrieved 1 January 2010. ^ "Clifford at the double" Football Association of Ireland. Retrieved 1 January 2010. ^ "Disappointment for Ireland" Football Association of Ireland. Retrieved 1 January 2010. ^ "Mase the ace" Plymouth Argyle F.C.. Retrieved 1 January 2010. ^ "Euro Joe" Plymouth Argyle F.C.. Retrieved 1 January 2010. ^ "Italy edge Ireland" UEFA. Retrieved 1 January 2010. ^ "Under-19's in 2009" Football Association of Ireland. Retrieved 1 January 2010. ^ "Step up for Mason". Plymouth Argyle. Retrieved 27 July 2010. ^ "Young U21s lose narrowly in Switzerland". Football Association of Ireland. Retrieved 3 September 2010. ^ "Joe Mason wants to be a first team regular for Argyle". The Herald. 7 July 2011. Retrieved 26 February 2012. ^ "Games played by Joe Mason in 2009/2010". Soccerbase. Centurycomm. Retrieved 28 July 2017. ^ "Games played by Joe Mason in 2010/2011". Soccerbase. Centurycomm. Retrieved 28 July 2017. ^ "Games played by Joe Mason in 2011/2012". Soccerbase. Centurycomm. Retrieved 28 July 2017. ^ "Games played by Joe Mason in 2012/2013". Soccerbase. Centurycomm. Retrieved 28 July 2017. ^ a b "Games played by Joe Mason in 2013/2014". Soccerbase. Centurycomm. Retrieved 28 July 2017. ^ a b "Games played by Joe Mason in 2014/2015". Soccerbase. Centurycomm. Retrieved 28 July 2017. ^ a b "Games played by Joe Mason in 2015/2016". Soccerbase. Centurycomm. Retrieved 28 July 2017. ^ "Games played by Joe Mason in 2016/2017". Soccerbase. Centurycomm. Retrieved 28 July 2017. ^ "Games played by Joe Mason in 2017/2018". Soccerbase. Centurycomm. Retrieved 28 July 2017. Wikimedia Commons has media related to Joe Mason.